Released as Star Rank Boxing by Gamestar in USA. WELCOME TO THE WORLD CHAMPIONSHIP Congratulations. You've been invited to participate in the challenge of Barry McGuigan's World Championship Boxing. Raw, iron-twisting strength is definitely an asset, but for a shot at the title you'll need more than that... like strategy, finesse, lightning fast reflexes and a mental toughness that most games are afraid to require. Before you grab your gloves please read this official programme. We'll explain some of the finer points and strategies of the game, teach you to become an effective puncher, and introduce you to the World Championship circuit. THE WORLD CHAMPIONSHIP CIRCUIT "The air was electric when the two boxers climbed into the ring. But by the time the bell sounded the end of the sixth round, the elecricity was gone and a startled hush had fallen over the crowd. 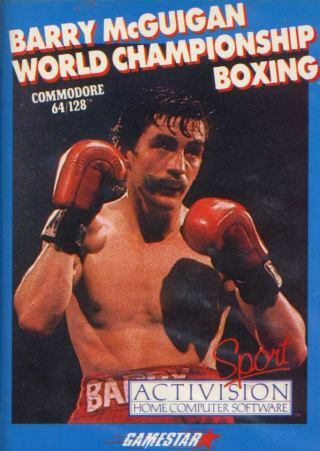 Sonny Robinson, the seemingly undefeatable world champion, was falling prey to an unknown Irish powerhouse named Barry McGuigan. The challenger established his intentions early in the fight. Late in the third Robinson released a left hook that would have knocked out most men. He stood a second, waiting for the tough Irishman to fall to the canvas. Instead, McGuigan came back with a powerful body shot that drove Robinson against the ropes. The champ was stunned. His right crosses didn't seem to slow the Irish attack and his vaunted left jab simply could not keep the aggressive McGuigan at bay. By the end of the seventh round it was clear that Robinson would have to unload his best punches and win by a knockout or not at all. But the effort just tired the champ and with 32 seconds left in the ninth round the powerful Irishman unleashed an explosive uppercut that sent Robinsin down for the count." Sonny Robinson, Thunder Thompson, Lucky Lou Lyndon, Flash Fenwick, Bashin' Bill Snow & BoomBoom Barnett.